I’m hurting in ways I never experienced before. My body feels like it’s rejecting the DNA that composes it. I also have a very nasty infection in my throat that came from nowhere. The two day marathon climb up Toubkal with an 80lb backpack has some side effects I wasn’t anticipating. Fortunately, my sister and I found the Ryad Da Vinci in Marrakech with only a minimal amount of effort considering we had no idea where we were going. After a slightly frightening wander through dark alleys a very helpful kid guided us to our temporary home. My sister and I promptly showered rinsing off layers of sweat, dust and blood. Licking our wounds we decide to medicate and order four miniature beers for dinner, with a side of pizza. Neither one of us wanted to stay up late. We crashed early to the omnipresent and bustling sounds of Marrakech in the distance. When we wake up our step brother is still sleeping. During the night we were joined by my father and his wife. Today, we’re headed to the Sahara — a 10 hour drive across Morocco. At 7:30 AM our driver arrives expecting to find four instead of five passengers. 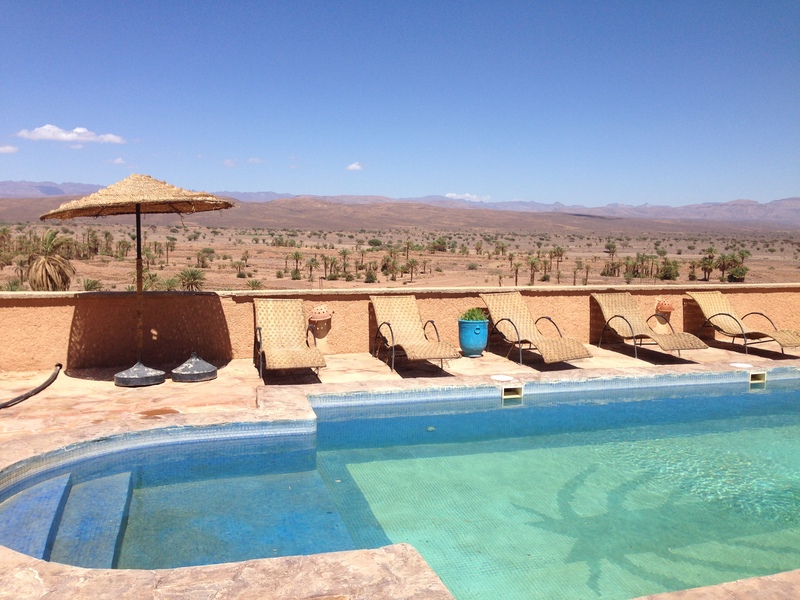 After a routine discussion about deposits and expectations we speed off from Marrakech toward the Atlas mountains. We zip around the outside of town and slowly begin to put some distance between us and our recent past. After about an hour of driving we begin a gradual but impressive ascent. Neighborhoods turns into fields which turn into hills. The road begins to bend and our driver pushes harder on the gas pedal. We’re climbing over the Tizi n Tichka Pass at a speed that would rival any commercial airline. The mountains around us form steeply and reveal their cracked and hard nature. Wispy and frail clouds drift across the road and in between the peaks as we rocket toward the summit. After a harrowing hour long ascent we drop over the pass and take a quick pause at a local argon oil cooperative. I jump out of the car onto the parking lot, my feet crushing empty argon nut shells. We pick up a few bottles of water as the sun begins to bake the earth. We pass through Ourzazate, known as the Hollywood of Morocco. The town is decorated with quaint street lamps that welcome travelers. We stop for lunch with a view of an impressive oasis filled with palm trees. We eat in the shade of some undulating fabric; a hot afternoon breeze move across the terrace. We snack on roasted chicken, delicious olives, rare tomatoes and cold cokes. Our Berber waiter than speaks more languages than the UN. Every hundred miles the landscape seems to be come drier by an order of magnitude. Our car speeds across the hot tarmac and through ever smaller villages. 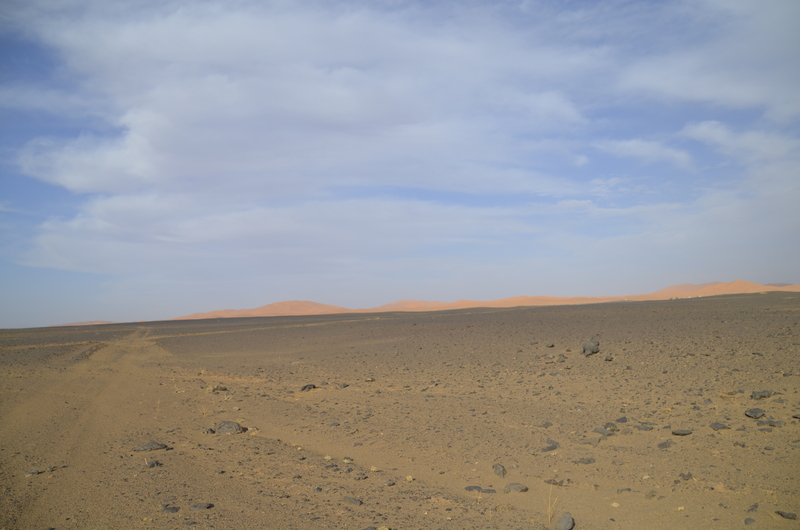 Finally we reach Risanni, and pass through the gateway to the Sahara. On the way out of town we are stopped by a police team. They spend twenty minutes auditing safety and first aid gear. Several powerful words are exchanged between our driver and the fee seeking authorities. Finally, another driver blows through the intersection and captures their imagination. We’re free to continue along. Half an our later there isn’t a plant in sigh and a moon-like environment wraps around the car. The Sahara. And you just need to see it for yourself.